Kristina Lawson (Partner) specializes in complex entitlement, land use, environmental and municipal matters. Clients turn to Kristina for help with the interpretation and application of local General Plans, specific plans, zoning ordinances, and the Subdivision Map Act; local land use initiatives and referenda; and state and federal laws covering natural resources, air and water. She is a respected authority on California Environmental Quality Act (CEQA) compliance and strategy. Kristina represents clients in local, state and federal administrative and judicial proceedings throughout California, primarily in the Greater San Francisco Bay Area and California’s Central Valley. In addition to her land use practice, Kristina often advises clients on public policy and government relations strategy. In addition to her professional work, Kristina is a former local elected official. From 2010–2014, she served on the city council and as the mayor of the city of Walnut Creek. 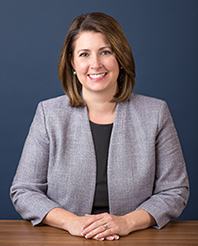 Kristina also previously served on the Central Contra Costa Solid Waste Authority’s board of directors, on the Association of Bay Area Governments’ regional planning committee, and as the vice chair of the League of California Cities’ environmental quality policy committee. In 2015, Kristina was appointed by Governor Brown to the Medical Board of California.